Let me tell you what happened and how. This story starts with a woman, an orchard, and a mortgage. In 1897, Mrs. Alicia St. Clair mortgaged half of her year’s fruit crop on 14.5 acres in the Willows near San Jose to a neighboring farmer, M. J. Farrington. She did so as security for the payment of $400. In nineteenth century America, lenders commonly used mortgages to extend credit to borrowers like Alicia St. Clair, and borrowers with farmland (like her) could offer their crops as security for the payment of a loan. In most of these instances, it’s usually impossible to know why someone was mortgaging their crops because it’s not clear why they were borrowing the money. If that someone is female and living in the late nineteenth century, it can even be hard to find her in the records and learn anything else about her life. But in this case, I found her. “Pen Pictures From The Garden of the World”, Edited by H. S. Foote (1888), page 442. So far, I knew Alicia was a widow with children and an orchard who remarried several years later. But it gets much more interesting. At the time of this article, H.F. St. Clair had just made another bank withdrawal on credit from his account, again accompanied by a woman who was not his wife. From the tone of the paper, it’s hard to tell which was supposed to be more scandalous to readers—the fact that a man cheated his wife out of her property, or the fact that he was apparently cheating on her with another woman. All of this would have been more than enough for me, because it provided a good reason that Alicia St. Clair mortgaged her crops two years later—she suffered considerable financial duress in her short-lived second marriage (By 1900, she was divorced and using Lupton as her surname again). That’s pretty much what I was looking for, research wise. You know how you just read that news brief about H. F. St. Clair getting thrown in jail? Well St. Clair read it too, and he was furious that this information about him had made the papers. So then he tracked down John V. Van Eaton, the San Jose Herald reporter who wrote it, and had it out with him. As it turns out, John V. Van Eaton was the brother of my great, great grandmother. I almost didn’t believe this when I saw the name, even though I knew I was likely related to him. 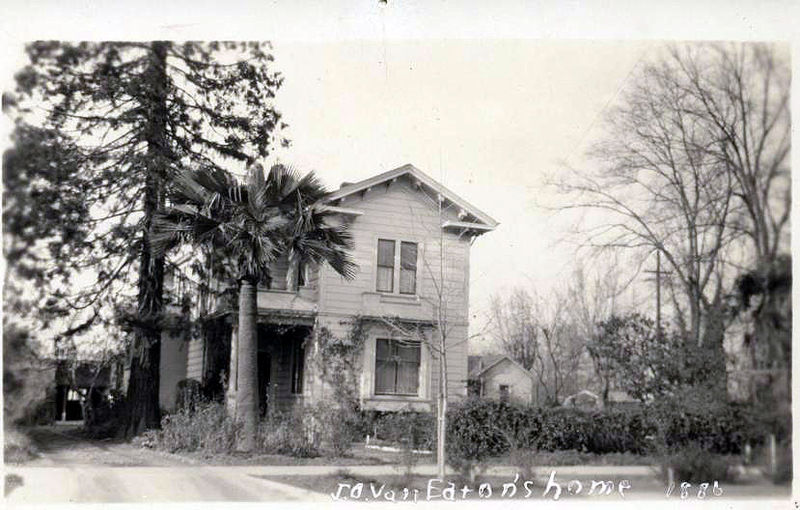 I already knew that the Van Eaton family had settled in the San Jose area in the 1880s. And sure enough, when I checked the genealogical records I’d pieced together on ancestry.com, I confirmed what I suspected. John V. Van Eaton was the brother of Harriet Van Eaton, my ancestor. This makes him my great, great grand uncle. This made the confrontation between Van Eaton and St. Clair all the more fascinating for me. Suddenly, I had a small personal stake in this history. But back to the story—so St. Clair stalked Van Eaton, but Van Eaton had him arrested AGAIN, this time for disturbing the peace. So of course what did St. Clair do? He continued to stalk Van Eaton—this time, apparently, with the intention of beating the crap out of him. It’s clear from the descriptions of Van Eaton “mauling” St. Clair and St. Clair’s resulting “badly bruised face” that he lost the fight. Three weeks later the Call confirmed that “St. Clair had decidedly the worst of it.” Both men were arrested after this altercation. St. Clair accused Van Eaton of battery, and a jury tried the reporter for this crime. He was discharged. It can be assumed that H.F. St. Clair was NOT clapping at the outcome of that trial. I’m not sure if there’s an easy takeaway message here, but here’s what I got out of the experience of following a research rabbit trail and ending up at my own family tree. History is filled with stories of struggles, misfortunes, tragedies. But as historians, we’re often far removed from the people who populate our pasts. So when a distant relative of mine entered the saga of a dastardly rogue swindling a widow out of her land, only to punch said rogue in the face, it was not only immensely satisfying on some level, it also pulled me even closer to all the actors in this story. I don’t think that’s a bad thing. It just made me ask even more questions. I also think this experience is a great example of how sometimes, the most interesting historical discoveries are made by accident. This time the discovery was a personal one. But I know I’m not the only one who has come across fascinating glimmers of some great untold story in the archives while searching for something mundane. Accidental discovery is one of my favorite things about the research process. Great post! It’s cool when history collides with family! Thank you Bethany for sending me the link to this article. Alicia Hicks Lupton was my great-great grandmother. She had a son George and he had a son Roy. Roy is the Father of my mother Dale Lupton Bunnell. I grew up in San Jose and as we drove down dry creek road in Willow Glen, my mother would tell me how the land there used to belong to her great grand parents. Until recently, she didn’t know the story of how Alicia was swindled out of her land. She only though that it ended up in the hands of the family of the man she married next after Jonathan. She was only half correct. Alicia never remarried (would you blame her?) and she lived to quite an old age outliving many of her children. I believe she lived with one of her sons that never married until the day she died in the 1930’s. I am so happy to hear that Mr. St. Claire received a good beating by your relative. Warms my heart! Thanks again for posting this in your blog. I will pass it along to my family. Amazing story! And your patience to get all this information. Congratulations! Very awesome.